It’s not often that I think long and hard about the air in my apartment. It’s air. But then again, I wouldn’t drink murky water, so why is it that I don’t remember to care about what goes in my lungs? 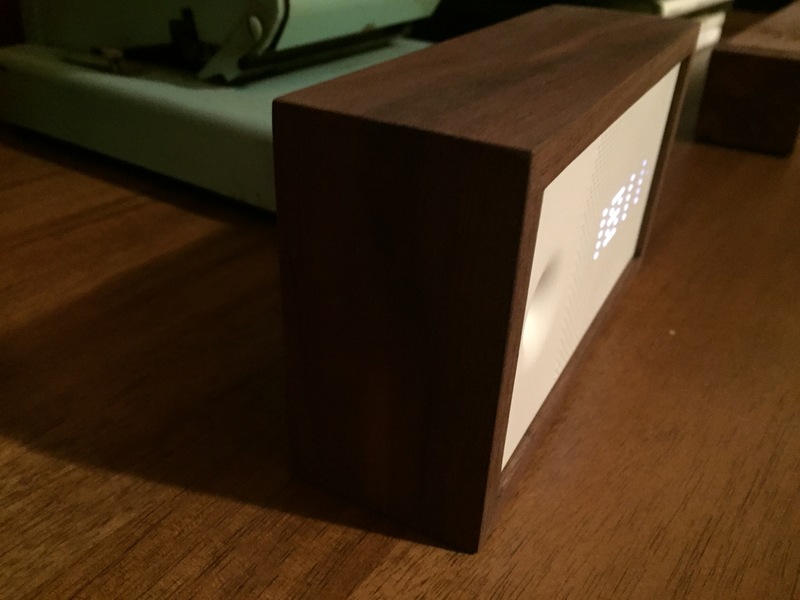 The Awair, a smart air monitor from BitFinder, is looking to bring the flair back to air. There are toxins in the air from chemical-based cleaners, plus dust and other general imperfections like a lack of humidity. The Awair gives you a read out on all of the different qualities of your air, grading your space on humidity, dust, VOCs, temperature and CO2. 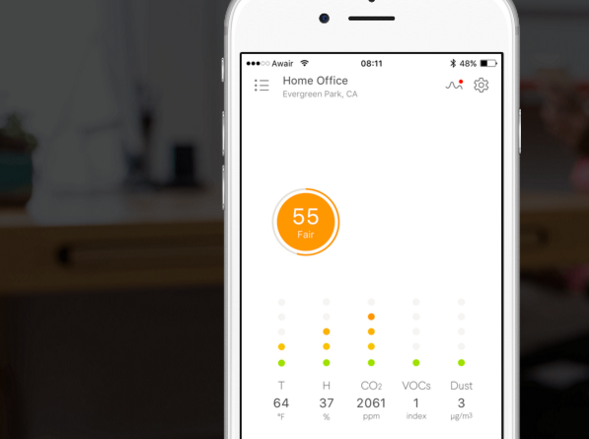 The device then makes suggestions based on your air quality score, all through a paired mobile app. It will tell you to buy a humidifier or switch to cleaners with less harmful chemicals. But the Bitfinder Awair goes beyond simply measuring the air quality and making suggestions to improve it. The device can actually help you target specific issues, like a tough time sleeping or various allergens. Users can set various goals like sleep, allergens, or productivity. For example, a user with Eczema could set their device to the Sleep preference and actively monitor the VOCs and humidity levels in the home. If you’ve set up any IoT device in your home before, like a Canary or Amazon Echo, this should be a piece of cake. Once you’ve downloaded the app, plug the device into an outlet in the wall and it should immediately display a four-digit pin with the LEDs on the front side of the Awair. Once you pair with Bluetooth by punching in the code (registering your device) you can use the app to connect the air monitor to your Wifi network. From there, you simply list your preferences and tell the Awair which room it’s living in, as well as your general location (ex. : Brooklyn, NY). quick note: if you unplug the Awair and place it in a new room, you’ll have to go through the setup process again. The look of the Awair makes a big difference for this little device. Prime billing in the smart home usually goes to a thermostat, a home security system, or something more utility-friendly like the Amazon Echo. But the Awair stands out by looking like something you’d put in your home anyway, even if it wasn’t checking for air quality. It looks like a little clock radio with LEDs shining out of the white front-side of the device. These LEDs can be set to show your Awair score, or simply display the time. The company is also beta testing a feature that will allow you to switch between displays by simply knocking on the top of the monitor. That way, a user can have the Awair set to show the time, and periodically knock to check the air score without diving into the app. With the simple, almost mid-century design and the use of wood, the Awair is quite the beauty when it comes to connected gadgets, which usually end up looking more like gadgets than home furnishings. 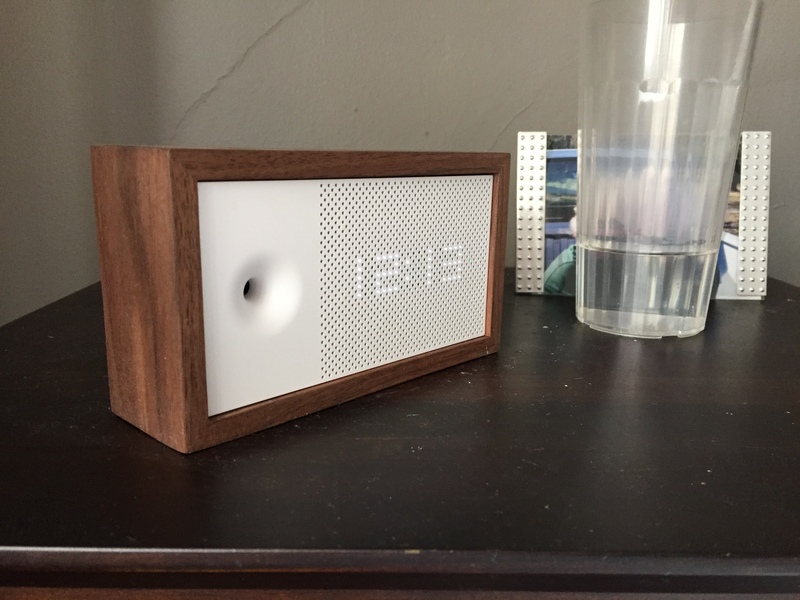 If you’re an indoor smoker who gets a kick out of Windex, chances are the Awair isn’t right for you, unless you’re looking for a chic-yet-expensive digital clock. But if air quality is a concern for you, whether because of allergies or sensitive skin or a general focus on health, the Awair is a pretty small price to pay ($199) for peace of mind.